In the past few years, I’ve made no secret of my general disdain for the direction Square Enix has taken their games. But, it should also be said that I only care because I used to love their games so much, being that they were formerly my favorite developer. The only game in years that I’ve been totally on board with is Final Fantasy XIV, but that is an MMORPG so it really does not factor into our game reviews or our Game of the Year discussions, and I did like World of Final Fantasy, but not nearly as much as our reviewer did. As a result, I had intended on skipping out on Octopath Traveler entirely. It was not really any sort of protest, just merely the fact that there are more games coming out every week than is even possible to play through, so spending money on a developer that is making decisions I don’t like is absolutely unnecessary. So what made me decide to review this game? Well it was the confluence of several events: 1. I was traveling a lot so the Nintendo Switch was the most convenient form of gaming for me in the past few weeks; 2. Fellow games media individuals who have also been dismayed at recent Square Enix games were pleasantly surprised, and 3. JRPGs are one of this site’s primary genres and therefore we should try to cover major entries when we can. So, I decided to purchase the game (thankfully in the quasi-rare physical form), and I am glad that I did. 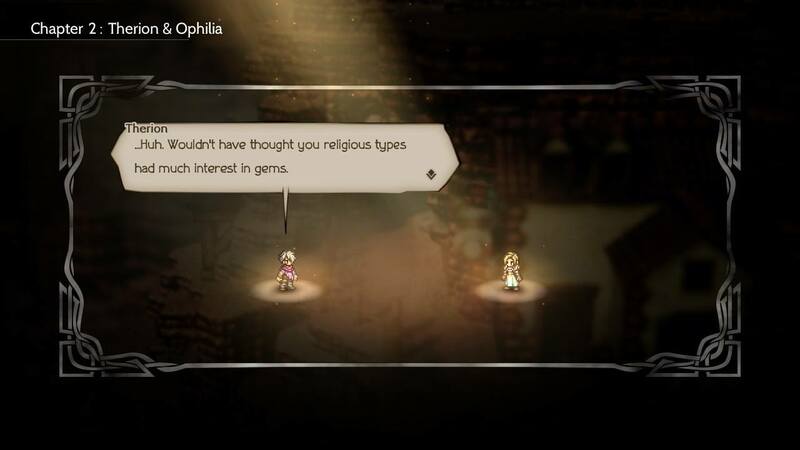 Arena combat is a well worn JRPG trope, but Octopath Traveler always does the tropes well. 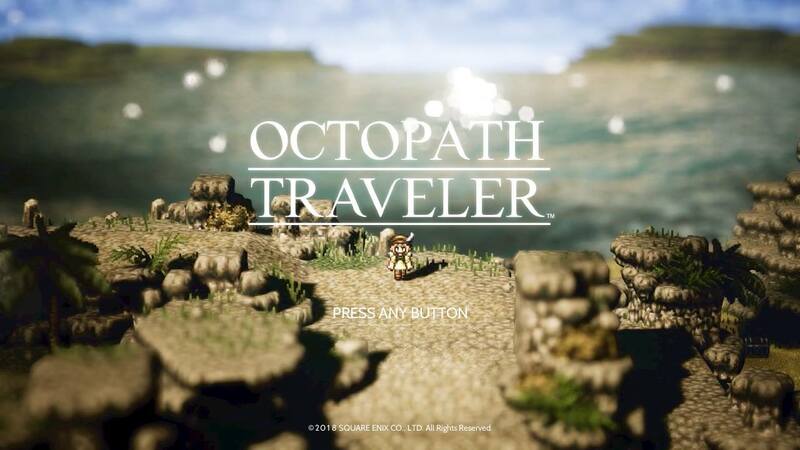 I am honestly a little surprised that the original name, Project Octopath Traveler, only ended up being Octopath Traveler. I was actually expecting this game to either get a Saga name, or even a name related to Live A Live. But the distinct advantage of making a new franchise is that, if it’s successful, you have an easy route to a series with its own brand recognition. After playing through the game all the way through the True Ending, I have to say that while this game does contain elements of Saga, Live A Live, Final Fantasy, and Bravely Default, it does enough to set itself apart as a different game entirely. There is no doubt that the pixel graphics and the turn-based combat are made to hearken back to the 16-bit era of JRPGs, and for me that is a very good thing. However, this game is not merely a nostalgia cash in, it actually represents what you think those games were more than what they actually were. Obviously the backgrounds and the environmental effects (especially water) are far beyond what was possible on the SNES during the heyday of Squaresoft, but the character models are also taller and much more emotive than even the characters in Chrono Trigger. After completing your initial character’s Chapter 1, you search the world for the other 7. Another aspect of this game that seems like a callback to JRPGs of old, but has a new twist, is the ability to choose which character you start with. 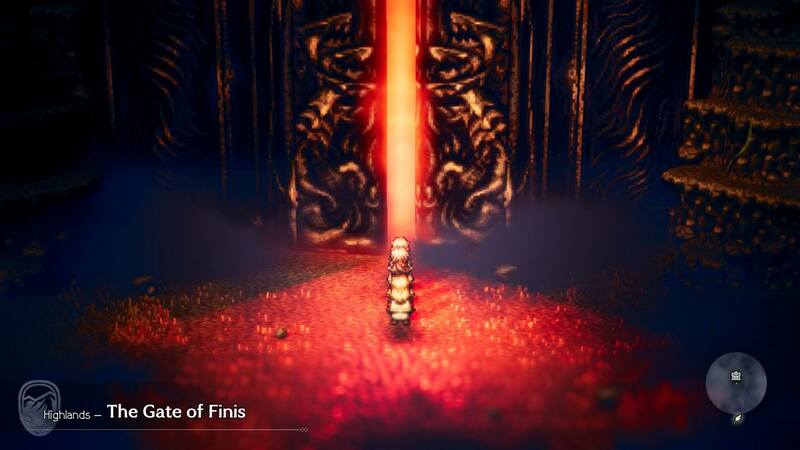 While a game like Final Fantasy VI featured prominent options very early on in the story, this game has even more wide open options than that game did. There are 8 different characters, each of them has their own starting Job and their own Path Action. Secondary Jobs that can be equipped by anyone are quickly earned and each Path Action also has a virtual mirror with another character. Path actions are skills that you use outside of combat to interact with the NPCs of the game. What I mean by virtual mirrors is that you can challenge an NPC to a duel with Oberic or fight them using your pet with H’aanit. Other ones are basically mirrors when it comes to Ophelia and Primrose, but somewhat different when it comes to either stealing with Therion or paying with Tressa. Each of them has their advantages, Tressa can buy some of the best equipment in the game and Therion is not able to steal them. However, Therion is the only party member that can open locked chests in dungeons. I would strongly recommend that you form a party that contains one of each of the mirrored Path Actions (my primary party was H’aanit, Therion, Cyrus, and Ophelia). The individual character stories vary widely in theme and tone, some are very adult or tragic. What separates the characters the most, and makes them more than just a name with stats, is their individual stories. The character stories vary immensely with their themes and their overall tone. That may be jarring to some people, but to me I found it to be refreshing after the dark tale of Primrose to have the refreshingly light story of Tressa. Moreover, one of the ways that this game won me over the most was with how adult they allowed some of the stories to go, particularly with Primrose. 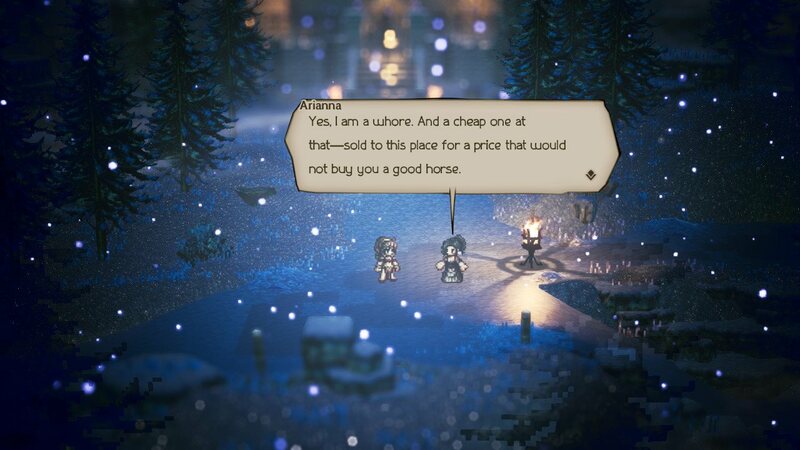 After the snafu of the “localization” or “self-censorship” with recent Square Enix titles (such as Bravely Second and Dragon Quest VIII 3DS), it was nice to see both Square Enix and Nintendo just allow this game to have real adult themes in it. A minor issue with the game is that each individual story is not extremely long, and they only represent a strong story based JRPG as a combined total, never individually. An issue that may seem more pressing, depending on your tastes, is how little the characters interact. 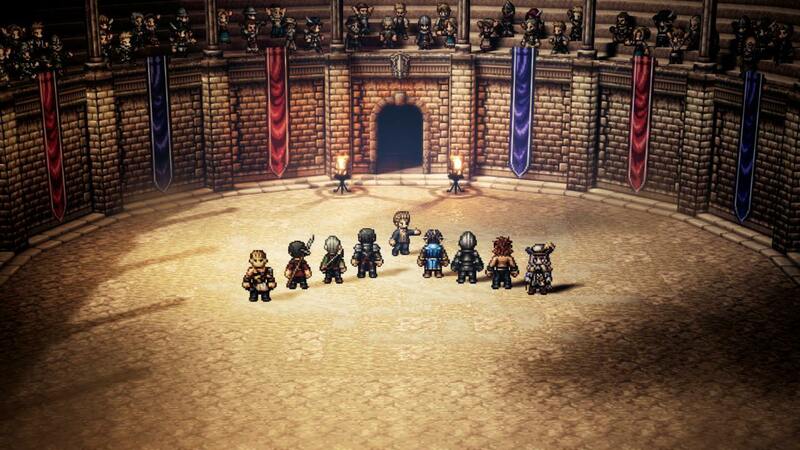 The party members will occasionally converse with each other after major events or in a Tavern. After you start the Chapter 2 stories with characters, there will be occasional circumstances where you will be able to optionally (with the + button prompt) enter a scene where the party members will converse with each other. This will happen after major story events or when entering a Tavern (this happens when one of the interacting characters is not in your current party). In Chapter 2, these events are fairly rare, but they become a little more common in Chapter 3 and especially Chapter 4. With escalating odds, it makes sense that the characters will have more to say to each other, especially because Chapter 3 stories usually involve a major betrayal (but not always). To some, that may seem to be a bit disappointing, but that is mostly if you expect this JRPG to have more of a linear story. Other than one major exception, that is simply not the case. For me that was not something that made me like it less, but for others, that can be enough to put them slightly off of the game. Each character has their own story end. 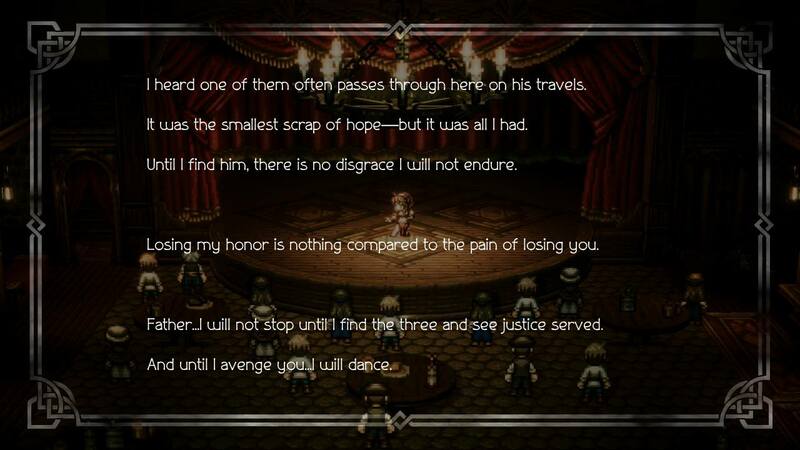 As a result of the separate stories, each character has their own story end after you complete their Chapter 4. You are always given a well-drawn ending screen, like you see above, and also after the first one you get to roll credits on the game. Of course, that does not represent the true ending to the game, or even close to that. One strange aspect of the game is that you cannot change out your starting character until you complete their Chapter 4. For me, that meant that I could not change out H’aanit for Olberic (her Path Action virtual mirror) until that point. 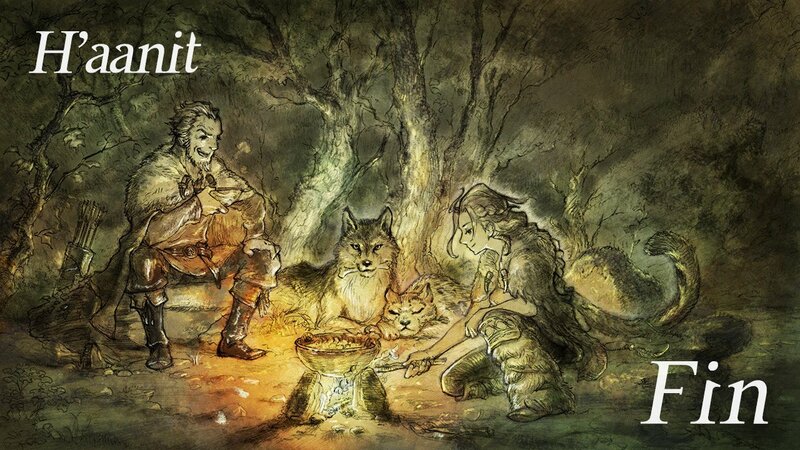 That wasn’t a major concern for me though, both because of how I played and because frankly H’aanit is the most powerful character in the game, even before you gain the super rare secret boss summons (such as Dire Wolf, Behemoth, and Fat Cat). But even after you finish their story, they will still have a major Epilogue side quest and they will open up the ability to steal or buy the best weapons and shield in the game. This is all necessary because even after you finish all 8 Chapter 4 stories, there is still one very major thing to do. This is the final dungeon of the game, one that many people don’t know exists.